Odds are, at some point during college or in the early years of your career, you were introduced to the acronym “SMART” as it relates to creating business goals and objectives. The approach, made popular by Peter Drucker, proposed that for business goals to be effective, they had to be: Specific, Measurable, Achievable, Relevant and Time- bound. For years, it’s a structure that has provided a useful means for setting and achieving goals. But the SMART approach has always had a major, nagging flaw – it’s only able to look at goals individually in isolation, rather than collectively. So, while SMART can still serve as a highly effective way to set and achieve personal goals, it will never be able to accurately account for the complex interrelationships and interdependencies of multiple goals across an entire organization. Thus, the impetus behind the creation of “Objectives and Key Results” (OKRs). Developed by Andrew Gove at Intel and later widely popularized by John Doerr in his book Measure What Matters, OKRs offer a better way to connect every individual team member to your enterprise’s strategic growth plan. With OKRs, agreement is first established on the high-level, long-term goals of the organization. These goals then directly inform a more actionable 1-3-year plan for specific financial and growth-oriented objectives and key results. Those enterprise-level OKRs then serve as the basis for building out OKRs at the team level (in the form of specific 90-day action plans) and ultimately down to the individual level. Correctly structured and implemented, OKRs create an optimal balance of cascading objectives and key results throughout the entire organization, combined with input from each team member into their personal objectives. This creates top-down alignment while individuals feel a greater sense of ownership and engagement. In an OKR environment, everyone’s objectives and key results are visible and openly shared, including those of the team leader(s). This transparency fosters collaboration, identifies team dependencies, and eliminates redundancies, as each team and individual are aligned to the same ultimate objectives. OKRs help break down organizational silos on both a team and individual level by introducing a common language across your entire firm. They also enable greater individual accountability by clearly identifying specific areas of ownership and responsibility. But how do you begin to implement this strategy and how do you go about writing OKRs for your firm? 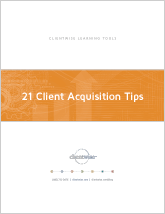 Objective: 20% of client acquisition to come from a new target segment (e.g., sports and entertainment). Execute new marketing strategy to generate 8-12 monthly inbound inquiries from target market. During the coming quarter, identify and schedule lunch meetings with 5 new professional advisors (e.g., attorneys, business managers) who network within the target market. Train team on new market information (industry trends, key concepts, buzz words, etc.). Place 3 targeted thought leadership articles in publications catering to the new segment. With your enterprise’s annual goals in mind, sit down with your team leaders and brainstorm 3-5 organizational OKRs for the coming quarter. Encourage them to work collaboratively to translate those organizational OKRs into specific OKRs for each team which will ensure the achievement of the higher-level goals. Schedule a half-day offsite for your entire firm to introduce the OKR methodology in general, as well as the specific OKRs you’ve identified at the firm and team level. You may want to bring in a coach or facilitator to ensure that concepts are communicated clearly and in a way that fosters full buy-in. As a take-away from this meeting, each team member will then work with their team leaders to draft their own individual OKRs. Rather than setting a few high-level goals at the start of the year that everyone soon forgets about, perhaps it’s time for a change. 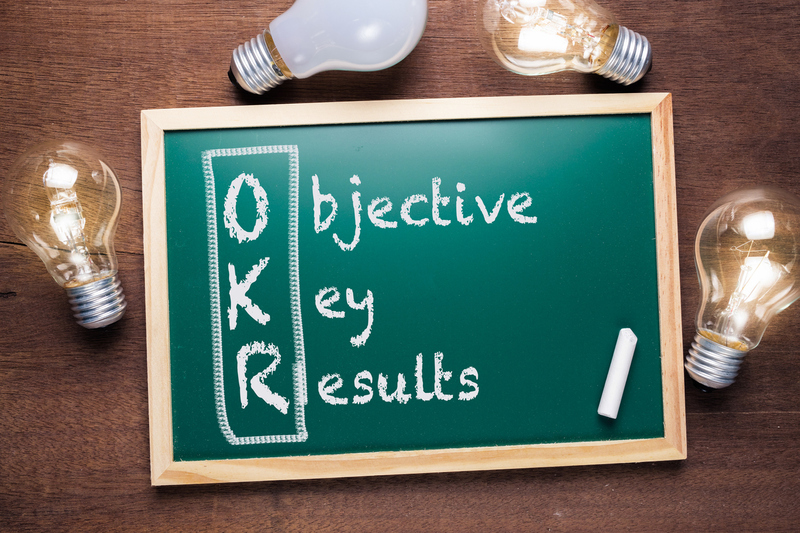 By creating a cascading alignment of goals and breaking objectives into smaller, measurable key results, OKRs have proven highly effective tools for staying on-track in today’s fast-paced work environments. Just remember that OKRs are intended to act as ongoing signposts and guardrails rather than a one-time event. So, it’s important that everyone regularly reviews their individual OKRs and continues to monitor their progress and performance. What financial goals do you have for your firm over the next year? What key results will be required to achieve those goals? What leadership goals do you have for the coming year? What key results will be required to achieve those goals? What team goals do you have over the next year? What key results will be required to achieve those goals? What client service goals do you have for your firm over the next year? What key results will be required to achieve those goals?